J. Robert Lennon is the author of a story collection, Pieces For The Left Hand, and seven novels, including Mailman, Castle, and Light of the Falling Stars. His most recent book Familiar was released in October of 2012. 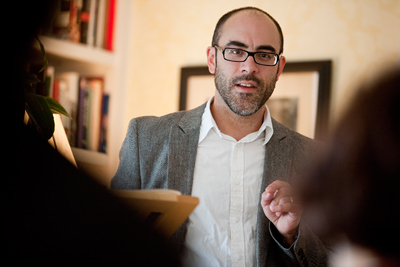 He teaches writing at Cornell University and is reading at Fiction Addiction on January 29, 2013. The L.A. Times put it well, stating that Familiar is “balanced at a perfect pitch between allowing us to believe what has happened to Elisa is real and to think that she’s has a mental breakdown brought about by anxiety and depression.” I certainly did not get the impression that you wanted the reader to have to decide, but, in your mind, is there a “truth” about what has happened to Elisa? When I started the book, I was pretty sure it was about a woman who falls into a parallel universe. It was only as I wrote, and then revised, that I became less and less confident in this idea, and more interested in the metaphorical possibilities the plot suggested. By draft 4 or so I had decided firmly not to know—and ultimately, one of the positions the book takes is that we are all inventing our own realities, for good or ill.
There’s a reference in the book to (presumably) yourself as a science fiction writer. But this book—and your writing in general—don’t strike me as bound to the genre of science fiction. It seems poised somewhere between reality and a-maybe-alternate reality, but in Familiar, nothing ever places it definitively on one side or the other. Do you see yourself as a writer of science fiction? That’s not supposed to be me! That is just a little po-mo wink. I shouldn’t have left it in, it’s too goofy. I think of myself as a writer of what I guess people call literary fiction, but increasingly this genre is permitted to absorb elements from other genres—to its great benefit. And science fiction was very formative for me, in my youth. I still read it with great pleasure. But I couldn’t call myself a writer of it, however much I’d like to. I thought several times of Remainder, by Tom McCarthy, as I was reading this book. Elisa’s insistence on recreating an existence, for one, but also in the way that attention to detail can unnerve you. The way that the fate of the world (or Elisa’s world) can seem to rest on a crack in the windshield, or a can by the side of the road. And, in reading it, you want to follow her, to believe that those details are everything. Were there any books that inspired you to write Familiar? I read somewhere that 9/11, in part, shaped the story for you, which I love. Returning to a world that is familiar, but ultimately, changed. But what about other books? Well, I think that Remainder is probably the strongest immediate influence on the book. I’ve also spent a lot of really pleasurable time over the past few years reading crime fiction written in rather clipped, straightforward language, particularly Lee Child’s Reacher books, and Richard Stark’s heist novels. The subject matter of those books doesn’t interest me as a writer, but the sentences do. I wanted to write something more spare, with much left unsaid. This is not my usual modus operandi, in writing or in life. If you had to describe the progression of your own writing, how would you say it has developed over time? On the one hand, I’m doing less blind, overconfident flailing around, and have become more self-aware. On the other hand, I now work harder to get myself into a state where I am not thinking too hard about what I’m doing. I’ve become more naturally artificial, or artificially natural. You also compose and record music. Are these two types of writing at all related to you? You wrote both a short story collection and an album titled Pieces for the Left Hand. Is this because you see the two as expressions of the same thing, or I am reading too much into that? It’s a cool title, so, that’s also a reason to use it twice. Glad you like the title! The album was supposed to be a promotional device for the book—but as it happens, it was harder to make than the book was. Boy, though, did I learn a lot about music, trying to write and record 100 really short songs. Historically, there hasn’t been much overlap between writing and music for me, though that has changed recently—I’m now in a band with three other fiction writers (and a lawyer, to keep us honest, I guess). I am actually working on a piece on this subject, so I’ll keep mum about it for now. I also wondered about your novel Happyland. Any chance it find a home with a publisher in its entirety now that it’s been out in installments with Harper’s and hasn’t seen any legal backlash? Dzanc Books is supposed to be publishing an unabridged ebook soon! I’ve gone over the proofs, but I haven’t been given a pub date. You teach in the MFA program at Cornell. What do you find that your students most, or most often, need to hear? Well, I’m not sure what they need, but I do find myself telling them not to worry so damned much. They are, by and large, way better at writing than they realize, and don’t need to be as concerned about their careers as they are. They just need to dig deep and do the work, and good things will happen. The notion of a career is very distracting at any age, but especially when you’re starting out, and are so uncertain of the future. It’s hard for all of us to ignore, but it’s most important to learn this skill early: not thinking about your career. What piece of advice (if you were to choose one) has been the most beneficial to your own writing? Two people, my wife Rhian Ellis and my friend Elizabeth Rogers, both superb writers, keep telling me to take my time with my work. I’m very impatient, and it’s probably not beneficial to me in the long run. So I’m trying to learn this skill. Familiar is the first fruit of this effort, actually—I did a great deal of revision, more than I expected to, and more than I usually do. Last, but not at all least, why do you write? Flannery O’Connor’s answer to this question was, “Because I’m good at it.” I don’t think I’ve got the right (or, frankly, the stones) to say that, but I will say that it’s because it is something I can do, and I can usually manage to make something that makes me happy. Whether it makes anyone else happy is beyond my control and I suppose is immaterial. But, you know, I get off on it, so I keep doing it.